Amyotrophic lateral sclerosis (ALS) is a fatal neurodegenerative disease that afflicts approximately 1 in 400 people worldwide (Alonso et al., 2009). Diagnosis is predicated on symptoms of motor neuron (MN) loss from the primary motor cortex (upper MNs), brainstem and spinal cord (lower MNs), which results in progressive weakness and loss of motor control, and eventually paralysis and death (Rowland and Shneider, 2001). While predominantly a motor disorder, many ALS patients experience cognitive and behavioral changes, and ~10–15% of ALS patients meet formal criteria for a diagnosis of frontotemporal dementia (FTD; Lattante et al., 2015; Ling et al., 2013). FTD is a heterogeneous condition marked by the degeneration of neurons in the frontal cortex, and patients exhibit a range of cognitive, behavioral and language deficits (Seelaar et al., 2011). The co-occurrence of ALS and FTD is genetically determined in some cases, most often by the dominantly inherited C9ORF72 (C9) hexanucleotide expansion (DeJesus-Hernandez et al., 2011; Renton et al., 2011). The presence of a single copy of expanded C9 increases sharply the chance that an ALS-afflicted individual will be diagnosed with FTD, from 10 to ~50% (Byrne et al., 2012). While consensus on precisely how the expanded sequence acts as a pathological unit has remained elusive, we have shown that the repeat-containing RNA can directly sequester the RNA-binding protein (RBP) hnRNP H, leading to dysregulation of pre-mRNA splicing (Conlon et al., 2016). Generally, our and others’ evidence for proteinaceous aggregates, seeded by RNAs and which are prone to undergo phase transitions (Fay et al., 2017; Jain and Vale, 2017; Schwartz et al., 2013), may offer a bridge from aggregation - as a classical observation of neurodegenerative disease (Ginsberg et al., 1998; Ross and Poirier, 2004) - to a biophysical mechanism at the origins of ALS/FTD, in cases both with and without disease-associated mutations (Alberti and Hyman, 2016; Conlon and Manley, 2017; Mackenzie et al., 2017; Murakami et al., 2015). Histopathologic similarities also link ALS and FTD on this disease spectrum. In almost all ALS and over half of FTD patients, the distributions of pathological cytoplasmic accumulation of the hnRNP-like DNA/RNA binding protein TDP-43 tend to correlate with areas of neurodegeneration (Baloh, 2011). Although the observed aggregates of TDP-43 come in several forms (Scotter et al., 2015), translocation and nuclear clearance events are of particular interest, as they have suggested a loss-of-function (LOF) mechanism (Vanden Broeck et al., 2014), predicted to impact mRNA processing and transport (Humphrey et al., 2017; Ling et al., 2015; Polymenidou et al., 2011; Tollervey et al., 2011). While TDP-43 aggregation could reflect the downstream effects of cell death rather than the cause, the existence of ALS-causing mutations in the gene that encodes TDP-43 (TARDBP) suggests that the protein has a deterministic role in the ALS/FTD spectrum (Scotter et al., 2015). Between the extremes of bystander and instigator, it is possible that changes to TDP-43 reflect an important indicator of upstream processes that influence RBPs more pervasively. In all ALS/FTD cases with TDP-43 pathology, aggregation may be driven by any number of factors that impact the protein’s ability to form stoichiometrically correct interactions with itself or with other nuclear proteins and RNAs. For example, disease-linked changes affecting the solubility properties of other RBPs (Harrison and Shorter, 2017), including hnRNP H (Conlon et al., 2016), have the potential to affect solubility of RBPs they interact with, like TDP-43 (Freibaum et al., 2010; Ling et al., 2010), although whether this occurs in ALS/FTD patient brains is unknown. Extending this idea, downstream changes to the transcriptome, particularly splicing patterns, may result from combinatorial deficiencies of several RBPs (Huelga et al., 2012; Mohagheghi et al., 2016), making it difficult to pinpoint the initiating event or distinguish specific effects of TDP-43 LOF. In this study, we have investigated whether the biochemical ‘signature’ we described previously for C9ALS might extend to a broader spectrum of ALS/FTD patients. For this, we analyzed splicing and RBP solubility in 50 postmortem human brains from patients with sporadic ALS, FTD with motor neuron disease (MND) and ALS-FTD (collectively, sALS/FTD), all of which were negative for known disease mutations, including C9. Unexpectedly, we identified splicing dysregulation of known hnRNP H targets (Conlon et al., 2016) in a large fraction of patients, and used the extent of splicing dysregulation to divide the patients into two groups, like-control and like-C9. 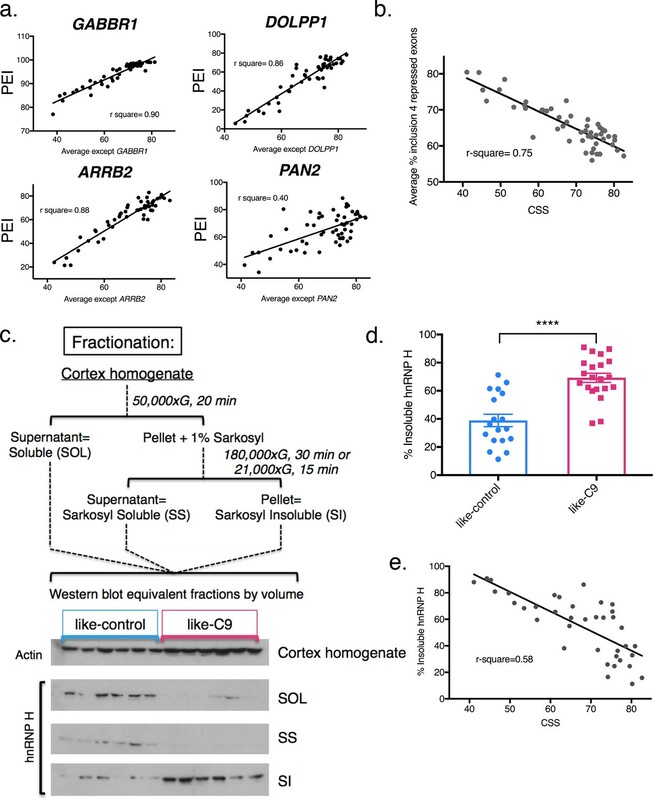 Notably, we found that the like-C9 patient brains also had higher amounts of insoluble hnRNP H, the amount of which directly correlated with the magnitude of splicing dysregulation. 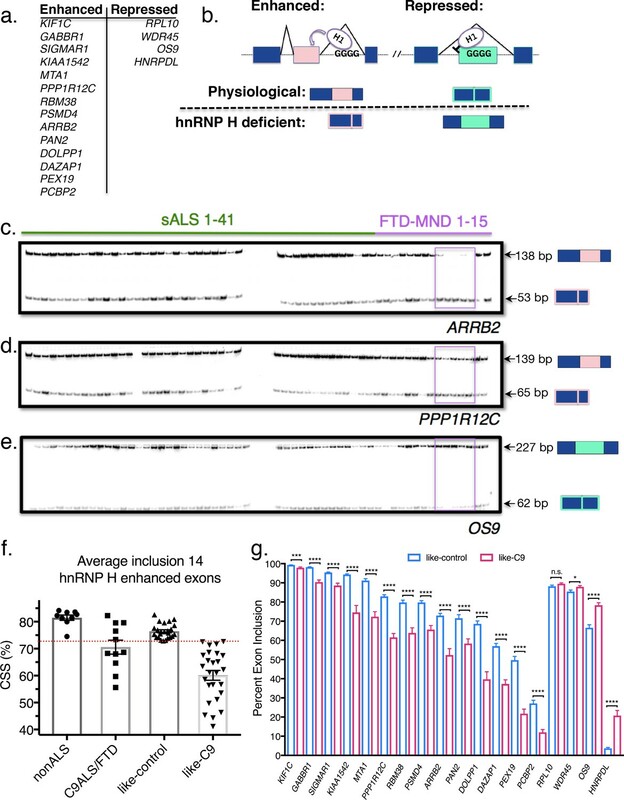 Importantly, several other abundant RBPs linked to ALS, including TDP-43, showed the same patterns of insolubility as hnRNP H. Consistent with this, we found pervasive splicing dysregulation genome wide in like-C9 brains. Intriguingly, the like-control cases with lowest hnRNP H/TDP-43 insolubility displayed almost no splicing dysregulation, despite the ubiquitous presence of histopathological TDP-43 inclusions. Finally, and importantly, we show that like-C9 patients, similar to actual C9ALS patients, were much more prone to develop dementia than were like-control patients. Together, our data define unanticipated biochemical similarities between a large fraction of sALS/FTD cases and C9ALS/FTD, suggesting a common mechanism underlying disease pathogenesis. C9 expansion is the most common known cause of ALS/FTD. However, a large majority of cases, especially amongst the 90% that are sporadic in origin, are of unknown etiology. When initially characterizing hnRNP H-dependent splicing events, we compared C9ALS/FTD patients to neurological controls and SOD1 ALS (not believed to proceed through a mechanism of RBP dysfunction or aggregation; Ling et al., 2013), but not to sALS/FTD (Conlon et al., 2016). Indeed, sALS/FTD is a mechanistic unknown and may constitute a wide range of molecular subtypes. Given that TDP-43 and hnRNP H appear to interact (Appocher et al., 2017; Ling et al., 2010; Sephton et al., 2011) in a manner that is largely RNA dependent (Freibaum et al., 2010), it is reasonable to speculate that changes in RNA binding and/or solubility of one might impact the other, leading to more complex patterns of splicing dysregulation. We first set out to determine whether splicing patterns specific to C9ALS/FTD could be distinguished from those related to ALS/FTD more generally. To do this, we initially analyzed whether sALS/FTD patients display splicing changes similar to those we described in C9 patients (Conlon et al., 2016) (Figure 1a). Specifically, we measured alternative exon inclusion by 32P-RT-PCR of oligo(dT)-selected RNA samples purified from post-mortem cerebellum from 50 sporadic patients: 32 classified as ALS (without cognitive/behavioral involvement), seven as ALS-FTD (symptoms of both disorders during the patient’s life), and 11 as FTD with motor neuron disease (FTD-MND) defined by a lack of clinical ALS symptoms yet the presence of pathological MN degeneration at autopsy. We also included two patients carrying pathogenic SOD1 variants, and four patients carrying C9 repeat expansions, for a total of 56 cases (Supplementary file 1A). Patient stratification into like-control and like-C9 groups by aberrant splicing of known hnRNP H-target exons. (a) List of hnRNP H target exons, separated into enhanced and repressed categories. (b) (Top) Simplified diagram of enhanced and repressed exons with relative binding of hnRNP H (H1). (Bottom) Depiction of expected product when H1 levels are at normal physiological levels (above dashed line) or low (hnRNP H deficient; below dashed line). (c–e) Representative PCR gels of all patient samples for two enhanced exons (ARRB2 and PPP1R12C) and one repressed exon (OS9). Pink boxes show samples F09-F13 that consistently exhibited large magnitudes of change in inclusion. (f) Graph of CSS by group: nonALS, C9ALS, like-control and like-C9. Each point represents the CSS of an individual patient. Red dashed line marks the cutoff of 3 standard deviations below the control mean. Error bars are plotted to the SEM. (g) Comparison of percent exon inclusion of 18 hnRNP H-target exons between like-control and like-C9 patient replicate values. Exons are ordered by enhanced exons (KIF1C-PCBP2) followed by repressed exons (RPL10-HNRPDL). Error bars are plotted to the SEM. (t test p value: *=0.05, **=<0.01, ***=<0.0001, ****=<0.0001). To assay hnRNP H-dependent splicing changes, we selected 18 known hnRNP H target exons that we previously found are differentially included in C9ALS/FTD compared to individuals without neurological symptoms and SOD1 ALS controls (Figure 1a). Four of the targets were hnRNP H-repressed exons, meaning hnRNP H normally represses inclusion when physiological levels of the protein are high, and the other 14 were hnRNP H-enhanced exons, which respond with decreased inclusion when hnRNP H levels are low (Figure 1b). Results obtained with two enhanced exons (from ARRB2 and PPP1R12C) and one repressed exon (from OS9) are shown in Figure 1c–e. Representative gels for all other genes analyzed are shown in Figure 1—figure supplement 1. The data revealed dramatic differences across many of the patient samples. We observed several patients that consistently had the lowest levels of enhanced exon inclusion for all 14 exons, and noticed that these same patients had the highest levels of repressed exon inclusion (e.g. boxed FTD-MND samples 9–13; Figure 1c–e). Other patients consistently displayed the opposite trend, or a milder version of both. We next wished to classify the patients as either having or not having hnRNP H-dependent splicing changes. For this, we first averaged the percent inclusion of all the enhanced exons to define a single composite splicing score (CSS). We then compared the CSS values of sporadics to those of a set of neurological normal and SOD1-ALS controls, and to C9ALS/FTD patients. Interestingly, we observed that for these same 14 exons, the controls had a very close range of values, while the C9+ range was centered significantly lower and with a wider distribution (Figure 1f). Only a single control point deviated significantly from the mean; this point corresponds to the second SOD1-ALS patient and is likely due to poor RNA quality. Due to the rarity of SOD1-ALS post-mortem samples, we decided against discarding this patient. This is the only sample in the entire set where RNA quality was compromised. We then wished to determine which, if any, of the sporadics had exon inclusion values in the range only accessible to C9+, and not control, brains. However, the wide range of CSS values of the C9+ group in theory made it impossible to classify a patient as C9+ or control based on a CSS similar to a control value. The converse, however, was not true: control samples had a close range of observed values, and all the patients with significantly lowered values were disease afflicted. Thus, we defined ‘like-control’ as any patient with a CSS within three standard deviations (SD) of the nonALS mean, since this range should encompass 99.7% of values within a normally distributed population. ‘Like-C9’ was then defined as all the patients with CSS values lower than this value. These two categories split the 50 patients into two groups of roughly equal size (Figure 1f). Comparison of like-control (n = 24) and like-C9 (n = 26) revealed a significant difference (p<0.05) between these two categories for each of the 18 genes, with only one exception, RPL10 (p=0.09) (Figure 1g). We next wished to determine, for every individual hnRNP H-regulated exon we analyzed, if each patient displayed similar relative change in inclusion values as for all the other exons. To this end, we first re-calculated the CSS for each combination of 13 enhanced exons and plotted a best-fit line for each gene in the case where it was excluded from the average, using each patient’s percent exon inclusion value for that gene as a Y-coordinate. Indeed, we found that each individual gene followed the trend of the patients’ average CSS (Figure 2a; simplified to show three best- and one worst-fit lines, all others are shown in Figure 2—figure supplement 1), with the same patients consistently showing the most severe changes, and others consistently showing the most mild. Some genes had extremely good fit to a linear model (GABBR1, r-square = 0.90, ARRB2, r-square = 0.88), while others displayed the trend without as good a fit (PAN2, r-square = 0.40). We also averaged the four hnRNP H repressed exons, and plotted this value as a Y coordinate (Figure 2b). As expected, the patients with the lowest values of hnRNP H-enhanced exon CSS had the highest levels of average repressed exon inclusion, as the data fit well to an inverse linear relationship (r-square = 0.75). Differential concentration of hnRNP H due to insolubility explains graded splicing dysregulation in patient brains. (a) Linear regression of percent exon inclusion (PEI) for each enhanced target exon compared to the average inclusion of all other enhanced exons. Clockwise from upper left: GABBR1, DOLPP1, PAN2, ARRB2, with r-square = 0.90, 0.86, 0.40, 0.88, respectively. (b) Linear regression of percent exon inclusion for the average of four repressed target exons compared to the average inclusion of all enhanced exons. R-square = 0.75. (c) (Upper) Diagram of biochemical fractionation and resultant fractions. (Lower) Representative example of 6 like-control and six like-C9 samples, western blotted for actin (cortex homogenate fraction) and hnRNP H (SOL, SS, SI). (d) Summary graph percent insoluble hnRNP H in motor cortex of like-controls versus like-C9s. Samples for which motor cortex was unavailable were excluded from this analysis. Each point represents a single patient with replicate values. Error bars are plotted to the SEM. (t test p value: *=0.05, **=<0.01, ***=<0.0001, ****=<0.0001). (e) Linear regression of percent insoluble hnRNP H compared to CSS, r-square = 0.58. The above results defined a cohort of patients that displayed graded splicing dysregulation similar to what we observed in C9ALS patients. We next asked whether these patients also displayed increased levels of sarkosyl-insoluble hnRNP H, indicative of functional sequestration (see Conlon et al., 2016). To this end, we performed biochemical fractionation of motor cortex from all cases where tissue was available, with two independent replicates per case (Figure 2c). While we performed RNA analysis with cerebellum for abundance and RNA quality reasons, for fractionation we used motor cortex as it is a primary site of disease-specific degeneration. Given the historical range of our cohort, for some samples motor cortex was unavailable, and thus we omitted those cases from our analysis. We then analyzed equivalent amounts of each fraction, soluble (SOL), sarkosyl soluble (SS), and sarkosyl insoluble (SI), by Western blot (WB), and calculated the percentage of insoluble hnRNP H in each case. Using 39 samples (18 like-control and 21 like-C9), we found that the average percent insoluble hnRNP H was 69.2 in like-C9s, and 38.9 in like-control, or 1.78 times higher in like-C9, a highly significant increase in aggregated protein (p<0.0001) (Figure 2d; all average percent insolubility values are shown by patient in Supplementary file 1A). This enrichment closely resembles the 1.9-fold increase we previously reported in seven C9ALS/FTD (56.1% insoluble) compared to controls (30.0% insoluble). We next wished to quantify the relationship, if any, between splicing severity and hnRNP H insolubility. We therefore performed the same regression analysis as we did above with splicing changes, except with percent sarkosyl-insoluble hnRNP H. We found that the general trend was for patients with large changes in splicing to have high insoluble hnRNP H (Figure 2e; r-square = 0.58). These observations suggest that hnRNP H is differentially sequestered, with patients showing a gradient of decreasing soluble hnRNP H that correlates with increasing splicing dysfunction. The correspondence between hnRNP H’s biochemical solubility and its predicted transcriptomic effects across distal brain regions from the same patients strongly supports the notion that this is an intrinsic, brain-wide property of each patient. Reinforcing this view, we also examined available postmortem pathological reports from 26 of the sporadic ALS/FTD patients. Significantly, 19 of these were noted to exhibit focal loss of Purkinje neurons in the cerebellum (Supplementary file 1A), confirming that regions of the brain undergoing robustly measured splicing defects did indeed experience neuronal degeneration. This further justifies our choice to correlate changes measured in the cerebellum with changes in the cortex. We previously provided evidence that the insolubility of hnRNP H in C9ALS brains was due to formation of aggregated assemblies with long, repetitive, G quadruplex-forming RNA (Conlon et al., 2016). However, in the sporadic cases analyzed here, the source of hnRNP H insolubility/aggregation is unknown. To investigate this question, and to understand the significance of the observed gradient of hnRNP H insolubility and splicing dysregulation, we considered the possibility that it is related to insolubilities of other proteins with similar functions and/or domain structures. For example, as mentioned above, TDP-43 displays histopathological evidence of cytoplasmic accumulation/aggregation in virtually all ALS cases. Is this relevant to the biochemical insolubility we observed with hnRNP H? To measure insolubilities of more protein targets, including TDP-43, we selected a subset of 20 patients: the 10 most like-control and the 10 most like-C9, based on highest and lowest CSS, respectively (and omitting cases where motor cortex was unavailable for fractionation) (Figure 3a). First, to demonstrate clearly the gradient pattern of these samples for hnRNP H insolubility, we performed simultaneous WB of all 20 samples and each of the three fractions (soluble, sarkosyl soluble and sarkosyl insoluble) (Figure 3b). We also performed splicing analysis of a new hnRNP H-regulated target, ACHE (Nazim et al., 2017), further illustrating the relationship between hnRNP H insolubility and splicing dysregulation (Figure 3c). Insolubility of hnRNP H correlates with insolubility of additional RBPs. (a) CSS scores and identifiers for 10 most like-control and 10 most like-C9 patients for which motor cortex was available. These patients were loaded in this descending order for all parts of this figure. (b) Fractionation (180,000 x G) of 20 sALS-FTD patients blotted for hnRNP H. SOL = soluble, SS = sarkosyl soluble and SI = sarkosyl insoluble. (c) Left: gel of ACHE alternative splicing in 20 sALS-FTD patients, loaded in order of highest to lowest CSS. PCR products are identified at right. Right: diagram of primers used and hnRNP H binding motif. (d) Fractionation shown in (b) with western blotting for the following targets (clockwise from upper-left): TDP-43, FUS, GAPDH, hnRNP A1. Each target is shown with three panels representing SOL, SS and SI, from top to bottom. (e) Quantification of percent insoluble protein (180,000 x G) in these 20 cases, with replicate values. Error bars are plotted to the SEM. (t test p value: *=0.05, **=<0.01, ***=<0.0001, ****=<0.0001). (f) Linear regression of percent insoluble hnRNP H, TDP-43, FUS, hnRNP A1 and GAPDH for 20 sALS-FTD patients, plotted against CSS. R-square is listed in legend. Having established these 20 cases as representative of the hnRNP H gradient, we used the motor cortex fractions derived from them for WB for three other ALS/FTD-implicated hnRNPs: TDP-43, FUS (also known as hnRNP P2), and hnRNP A1 (Figure 3d). These proteins all belong to a common yet dynamic interactome (Markmiller et al., 2018); FUS has been reported to interact with hnRNP H (Reber et al., 2016) and hnRNP A1 (Kim et al., 2013), while hnRNP A1 has been reported to interact cooperatively with hnRNP H to modulate splice site selection (Fisette et al., 2010). 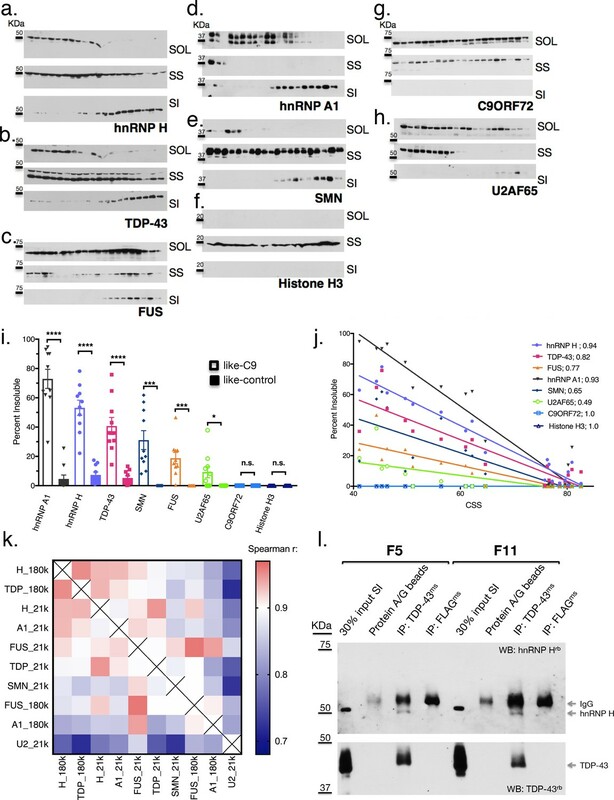 Likewise, TDP-43 was shown to interact with the structurally related hnRNP A1 to repress exon inclusion (Buratti et al., 2005) and has also been suggested to self-associate (Polymenidou et al., 2011; Tollervey et al., 2011) to influence a set of targets it shares with FUS (Lagier-Tourenne et al., 2012). As a control, we also blotted for GAPDH, which seemed unlikely to be insoluble. Strikingly, for each RBP target we found significant increases in insoluble protein in the like-C9s, matched by significant decreases in soluble protein (Figure 3e). Indeed, no insoluble FUS could be detected in any like-control patient, while it was present in all of the like-C9s (between 6.1 and 69.1%). Intriguingly, we found that the correlations between CSS and percentage insoluble protein for hnRNP H, TDP-43, FUS and hnRNP A1 each fit remarkably well to a line (r-square = 0.89, 0.79. 80 and 0.90, respectively) (Figure 3f). Analysis of GAPDH revealed no insoluble protein in any of the 20 cases (Figure 3e) confirming that insolubility of these RBPs was not due to an artifact of fractionation or global protein insolubility in like-C9s. The above results were unanticipated, and we therefore wished to examine properties of the insoluble fractions further. One possibility was that the high force (180,000 x G) used to generate the sarkosyl insoluble fractions might have resulted in an artificial enrichment of RBPs in the pellet of some patients, and thus, the similar insolubilities of these targets may not reflect physiological interactions. To examine this, we decreased the sedimentation force we used to isolate the aggregated proteins, by separating the sarkosyl insoluble pellet at 21,000 x G for 15 min instead of 180,000 x G for 30 min. We performed simultaneous fractionation and WB of the 20 cases described above, and expanded our targets beyond hnRNP H, TDP-43, hnRNP A1 and FUS to include three additional proteins that we would not expect a priori to be insoluble: Histone H3, C9ORF72 itself and splicing factor U2AF65. We also included one more target protein with broad relevance to MN disease, SMN, which has been reported to interact with RBPs in the context of RNA transport granules (Hua and Zhou, 2004; Thomas et al., 2011; Murakami et al., 2015). The results of this analysis confirm and extend the observations we made with the 180,000 x G fractionation. They support the idea that the insolubility we initially described for hnRNP H (Figure 4a) extends to other MN disease-related proteins (Figure 4b–e), but is not a general property of like-C9 brains. The non-disease associated proteins (Figure 4f and g) did not display any insolubility, except for U2AF65 (Figure 4h), which had low levels of insoluble protein in six of ten like-C9s, or 9.2% on average (Figure 4i). Intriguingly, a fraction of SMN was insoluble in all the like-C9 cases with a range from 8.1–61.8%, or 31.1% on average, but in none of the like-controls. For comparison, hnRNP H and hnRNP A1 were insoluble in like-C9s with a range from 16.0 to 77.5% and 29.4 to 94.7% (Figure 4i). Despite the important role of SMN in snRNP assembly, and thus in splicing per se, its relatively low average insolubility in like-C9s suggests it is only partially deficient and thus present at levels sufficient to facilitate snRNP assembly, and far higher than levels seen in SMA (Lefebvre et al., 1997). The low levels of U2AF65 and presence of the four abundant hnRNP proteins in the insoluble fraction is supportive of the like-C9s having alterations in the soluble concentration of a limited set of auxiliary splicing factors, yet maintaining sufficient concentrations of the core factors necessary for splicing. Like-control ALS/FTD patients have undetectable levels of insoluble RBPs after low-speed fractionation. (a–h) Low-speed (21,000 x G) fractionation experiment with 20 patients listed in Figure 3a. Western blot hnRNP H (a), TDP-43 (b), FUS (c), hnRNP A1 (d), SMN (e), Histone H3 (f), C9ORF72 (g), U2AF65 (h). SOL = soluble, SS = sarkosyl soluble, SI = sarkosyl insoluble. (i) Quantification of low-speed centrifugation of 20 patients with replicate values. Error bars are plotted to the SEM. (j) Linear regression of percent insoluble protein for targets in (a–h) plotted against CSS. R-square is listed. (k) Heatmap of spearman correlation coefficients for each pairwise comparison of percent insoluble protein at 180,000 or 21,000 x G (180 k and21k, respectively). (l) Western blots of hnRNP H (top) and TDP-43 (bottom) following IP with protein A/G magnetic beads alone, TDP-43 antibody, or control (FLAG) antibody from two patient brains (F5 and F11). The abbreviations ms and rb stand for mouse antibody and rabbit antibody, respectively. Protein species are indicated by arrows at right, and positions of size markers are shown on the left. The similarity between hnRNP H and TDP-43 insolubilities in the like-C9 samples suggests that a common process or factor may be functioning to bring about their aggregation to correspondingly severe degrees. Supporting this idea, insolubility of each protein displayed an inverse relationship with CSS (Figure 4j), and correlation analysis of the measured insolubilities of all these RBPs (at both 180,000 and 21,000 x G) amongst this set of 20 patients revealed highly significant correlation for each pairwise combination (Figure 4k). The top pairwise combinations between different proteins were between hnRNP H and TDP-43 at both 180,000 and 21,000 x G (Figure 4k; Spearman r = 0.95 for both). Supporting the idea that primary insolubility of hnRNP H can drive insolubility of these other factors, we performed fractionation at 21,000 x G with 13 C9 patients and found similar correlation between hnRNP H and TDP-43 (Spearman r = 0.71) (Figure 4—figure supplement 1). One explanation for the similar degrees of hnRNP H and TDP-43 insolubility in the sporadic and C9 patient brains is that they coexist in the same physical aggregates. To test this hypothesis, we performed co-immunoprecipitation (co-IP) of hnRNP H from eluates of the sarkosyl insoluble pellets of two like-C9 brains using a TDP-43 antibody for IP (see Materials and methods). Indeed, TDP-43 antibody successfully co-IPed hnRNP H, while a negative control antibody (FLAG-M2) or beads alone did not (Figure 4l). These results support a reciprocal relationship between insolubility of hnRNP H and TDP-43, whereby aggregates initially seeded by one protein can recruit the other, and vice versa. The possibility that a reciprocal relationship exists between hnRNP H and TDP-43 prompted us to consider that insoluble TDP-43 is upstream of hnRNP H insolubility in like-C9s cases. Etiologically, this is appealing, since hallmark TDP-43 histopathology is presumed to reflect underlying biochemical insolubility, and aggregation of TDP-43 into this non-functional and/or mislocalized state is often given as a rationale for mechanistic studies that have sought evidence for TDP-43 LOF (Polymenidou et al., 2011; Lagier-Tourenne et al., 2012; Ling et al., 2015). However, our data present a significant contradiction of this tenet, as 21,000 x G fractionation revealed TDP-43 to be, on average, only 5.3% insoluble in the 10 like-control patients. Meanwhile, 10 patients that were on the same clinical and pathological spectrum yet classified as like-C9 had on average almost eight times as much insoluble TDP-43 (40.8 versus 5.3%, t test p<0.0001) (Figure 4j). Fractionation of the same samples at 180,000 x G revealed a majority of TDP-43 to be insoluble in like-C9s (68.2%) compared to a minority in like-controls (25.2%; p<0.0001; Figure 3e). The above differential TDP-43 insolubility is in sharp contrast with the much more uniform histopathology. Of the 23 sporadic cases for which we possessed data for pathological analysis by immunohistochemistry with TDP-43 antibodies, only two were found to lack detectable TDP-43 inclusions in motor regions (Supplementary file 1A). One of these, s30, was a like-control case, while the other, F10, was the most like-C9 case (lowest CSS), and had an average of 61.8% insoluble TDP-43 based upon two measurements at 180,000 and 21,000 x G each (Figures 3f and 4i, respectively). Conversely, case 36 had only 2.3% insoluble TDP-43 based upon two measurements at 180,000 and 21,000 x G each (Figures 3f and 4i, respectively), yet TDP-43 pathology was indeed evident (Supplementary file 1A). The above observation suggests that insolubility of TDP-43, as well as hnRNP H, is not related to TDP-43 histopathology. Given that hnRNP H insolubility is correlated with splicing dysfunction of a set of validated targets, we next asked whether TDP-43 LOF-associated splicing changes also occurred more in the like-C9 cases than in like-controls. To assay TDP-43-dependent splicing, we selected targets from previously published TDP-43 knockdown (KD) and CLIP studies (Tollervey et al., 2011) and analyzed them as above by 32P RT-PCR (Figure 4—figure supplement 2). For 18 targets that produced appropriate products, we compared the percent inclusion values from the six most like-control and six most like-C9 patients (six highest and lowest CSS, respectively). Using a t-test for each event, and a more permissive cutoff for statistical significance (p<0.10), we found that 10 of the 18 events displayed significant changes. Of these events, eight were as predicted consistent with the like-C9 group having lower concentrations of functional TDP-43, while the other two displayed the opposite trend. These results suggest that TDP-43-regulated splicing events demonstrate differential exon inclusion amongst sALS/FTD patients with TDP-43 pathology, with the patients demonstrating biochemically insoluble TDP-43 displaying greater TDP-43 LOF. Our investigation into splicing dysfunction initially focused specifically on hnRNP H splicing targets. However, the results described thus far imply that the splicing changes due to decreased levels of functional hnRNP H are complemented by shortages of other RBPs such as TDP-43. We therefore analyzed transcriptome-wide splicing on a larger cohort of patients (28 sALS/FTD cases described above for which hnRNP H solubility and clinical data was available and an additional 13 confirmed C9ALS/FTD cases) using RNA-seq of RNA purified from cerebellum. As controls, we used a combined group of six neurologically normal individuals and five SOD1-ALS individuals, with only two of these 11 samples coming from our previously categorized control group (Supplementary file 1A). The decision to include SOD1 in the control group was made because SOD1-ALS represents the only known form of ALS marked by the absence of TDP-43 (or FUS) inclusions (Mackenzie et al., 2007). To analyze splicing patterns globally and without bias, we regrouped the patients in a manner independent of previously measured hnRNP H splicing. Instead, we divided the 28 sALS/FTD patients into three groups based on clinical diagnosis and hnRNP H insolubility: ALS-hnRNP H low insolubility (ALSlow; 7 patients), ALS-hnRNP H high insolubility (ALShigh; 13 patients) and FTD (FTD; 8 patients) (Supplementary file 1A). The first two groups consisted of patients with ALS only, and with measured hnRNP H insolubility being below or above 50%, respectively (Figure 5a). The FTD group consisted of those patients with clinical diagnoses of FTD. Interestingly, this group contained the five most severely like-C9 patients. Of the 11 FTD-MND patients in our cohort that were subjected to RNA-seq, only two, F3 and F7, had insolubility below 50%, and therefore were not included in this analysis, but rather used as test cases to ascertain the predictive power of the clustering with respect to insolubility. A fourth patient group consisted of C9ALS and ALS/FTD patients (C9). The average percentage insoluble hnRNP H (180,000 x G) in each group was 26.4 in ALSlow, 59.4 in C9, 67.3 in ALShigh and 79.6 in FTD (Figure 5b). In order to rule out differential hnRNP H levels in the cerebellum of these patients, we performed WB of tissue from 26 of the samples, and observed that there were no changes in overall hnRNP H abundance between these groups (Figure 5c). hnRNP H insolubility defines patient groupings for RNA-sequencing analysis. (a) Percent insoluble hnRNP H of 28 samples in RNA-seq analysis reveals 50% as a natural boundary between ALSlow (7 patients) and ALShigh (13 samples) samples. Percent insoluble hnRNP H of FTD patients (8 patients) is also shown. (b) RNA-seq groups plotted by CSS and percent insoluble hnRNP H. All samples used in RNA-seq differential splicing (DS) analysis groups are shown. (c) Western blots of hnRNP H (top) and histone H3 (middle) from whole-tissue homogenates from cerebellum of 26/28 samples used in RNA-seq analysis. Two ALShigh cases (s1 and s20) were excluded in order to fit all samples on one gel. Grayscale heatmap displays percent insoluble hnRNP H (bottom). (d) Venn diagram of all splicing events found to be significantly different between each patient RNA-seq group and the combined control/SOD1ALS group with PSI magnitude filtering (|∆PSI| ≥ 0.1). (e) Heatmap of all events in (d), except for the 6576 events found to have significant DS exclusively in FTD. Blue-red color scale represents Z-score for normalized PSI. Four rows above heatmap display whether each sample was included in the groupings used for the identification of DS events, termed 'In analysis' (black = yes, white = no), gender (pink = female, blue = male), Patient subtype (see key), and percent insolubility hnRNP H (180,000 x G), ranging from light (low insolubility) to dark (high insolubility) gray. Yellow is shown for cases without insolubility data. Patients are arranged by subtype, with increasing insolubility from left to right, where data is available. We next compared differential splicing (DS) events in each of the four patient groups to the controls. For this analysis, we used the annotation-free method Leafcutter (Li et al., 2018). Variations in intron splicing were considered significant in ALS/FTD when the Percentage Spliced Index (PSI) compared to control differed by more than 10% (|∆PSI| ≥ 0.1) with a 10% FDR cutoff (see Materials and methods). To confirm our assumption that neurological normal and SOD1 ALS could be grouped as one, we compared these two groups and indeed found very few (23) detectable splicing differences (|∆PSI| ≥ 0.1). The paucity of splicing defects in these patients contrasted with 1300–1400 DS events in ALShigh and C9 groups and several thousand in the FTD group (Figure 5d; events listed in Supplementary file 1B), with 488 events overlapping between C9, FTD and ALShigh. Comparison of events without filtering for the magnitude of the change in PSI revealed an even greater proportion of overlapping events between the FTD, C9 and ALShigh groups (Figure 5—figure supplement 1). As validation of our like-C9 nomenclature, with or without filtering respectively, only 27 or 8% of all events detected in C9 were unique to that group; the remainder were detected in ALShigh, FTD or both (like-C9 collectively). Of the remaining 73% of events that were detected in C9 (with filtering), approximately half (48%) were shared with both other groups, while 40 and 12% of events, respectively, were exclusively shared with FTD or ALShigh (Figure 5d). The higher degree of overlap of C9 with FTD likely reflects the fact that with few exceptions, this group had the largest average change in PSI for each event. Furthermore, the ALSlow group had an insignificant number of events, even without filtering, upholding our definition of like-control for splicing in general. We next wished to visualize the degree of change in splicing of all events by patient. For this, we produced heatmaps of the normalized difference in PSI for all the splicing events that differed significantly between control and any other group (|∆PSI| ≥ 0.1), excluding the very large number of events that differed exclusively between control and FTD (Figure 5d). Patients were organized according to the above groupings, and within each group they were further arranged by increasing hnRNP H insolubility from left to right (Figure 5e, gray-scale) to visualize the relationship between hnRNP H insolubility and changes in splicing. To extend our analysis, we also included 23 additional samples from C9, ALS and FTD patients that were not included in one of the groups above (Supplementary file 1A), creating an additional group of ALS patients (ALS) not categorized as ALSlow or ALShigh. Hierarchical clustering of splice junctions revealed two distinct groups of events that displayed opposite directions of normalized PSI change in the controls versus the FTDs (Figure 5e). As expected, the ALSlow group was found to be most similar to controls, and the FTD group the most different, reflecting the extreme ends of the insolubility spectrum. Within the C9 and ALShigh groups, the patients displayed a gradient of patterns from low to high insolubility that generally mirrored the pattern of PSI from control to FTD. We next sought to identify significant splicing changes in our dataset that best correlate with hnRNP H insolubility. We therefore ranked events according to their correlation to insolubility (Supplementary file 1C; 100 most correlated events) and plotted several. The results (Figure 6a) demonstrate that splicing of these transcripts was, as expected, affected by variations in soluble hnRNP H levels. Amongst these correlated events, the relationship to hnRNP H insolubility varied; for example, splicing changes at hnRNPA3 followed a linear relationship similar to BBS, GABRG2 and CCDC136; in turn, splicing changes at hnRNPH1 occurred only when hnRNP H insolubility was above 60%, primarily in FTD patients and some C9 patients. RIOK3 and several of the top 100 most correlated events with hnRNP H insolubility presented exponential trends similar to hnRNPH1 splicing defects. Perhaps this indicates that some events are regulated in compensatory fashions by many factors (see below), and only undergo change in inclusion when soluble levels of multiple RBPs are severely compromised. Global splicing differences correlate to hnRNP H insolubility. (a) Examples of events amongst the 100-most correlated to insolubility, with Leafcutter (LC) PSI plotted on the X-axis and insolubility (%) on the Y-axis. DS events are shown for the following genes (clockwise, from upper left): BBS2, GABRG2, HNRNPA3, HNRNPH1, RIOK3 and CCDC136 (events listed in Supplementary file 1C). (b) Heatmap of 100 events most correlated/anti-correlated (absolute value Spearman coefficient) with hnRNP H insolubility. Blue-red color scale represents Z-score for normalized PSI. Four rows above heatmap display whether each sample was included in the groupings used for the identification of DS events, termed 'In analysis' (black = yes, white = no), gender (pink = female, blue = male), Patient subtype (see key), and percent insolubility hnRNP H (180,000 x G), ranging from light (low insolubility) to dark (high insolubility) gray. Yellow is shown for cases without insolubility data. Patients are arranged by subtype, with increasing insolubility from left to right, where data is available. (c) Gene set enrichment analysis of top 200 dysregulated splicing events correlated to hnRNP H insolubility. (d) Heatmap of significant DS events that occur in a set of common splicing factor genes, simplified to the single most changed event per gene (hnRNPs, SR proteins, ALS-related RBPs or SMN; events listed in Supplementary file 1D). The same four rows apply as in (b). (e) Bar graph depicting that patients like-C9 are 3.8-times more likely to have symptoms of FTD than patients like-control (Fisher’s exact test, Odds ratio (OR) = 3.8, p=0.032). Broadly, the 100 events with the highest correlation with hnRNP H insolubility displayed variable splicing strength (intron exclusion ratios) across the cohort (Figure 6b; events listed in Figure 6—figure supplement 1), analogous to the pattern seen for all events (Figure 5e). Notably, among the highly correlated DS events were many in transcripts encoding RBPs (Figure 6c), such as splicing regulators, which generally followed the same pattern of PSI changes relative to insolubility in each group (Figure 6d; heatmap events listed in Figure 6—figure supplement 2; all events listed in Supplementary file 1D). Interestingly, several of the events found to affect RBPs (FUS exon 7, hnRNP A1 exon 8, hnRNP D exon 7 and TIA-1 exon 5) have been the subject of intensive inquiry for their potential roles in disease (Deshaies et al., 2018; Zhou et al., 2013) as well regulating splicing and interactions with other hnRNPs (Gueroussov et al., 2017; Izquierdo and Valcárcel, 2007). This observation raises the possibility that insolubility of the disease-associated RBPs leads to specific alterations in RNA splicing that compound defects in those same RBPs and others, thereby exacerbating the magnitude and extent of splicing dysregulation (see Discussion). Beyond the RBPs, several of the DS events were consistent with possible direct roles in disease pathology. One especially noteworthy example was the increased skipping of MAPT exon 10, observed in C9, ALShigh and FTD (Supplementary file 1B). Alternative inclusion of this exon perturbs a delicate balance between 3-repeat and 4-repeat Tau, and genetic mutations in exon 10 or the surrounding intron are a significant cause of familial FTD (Ghetti et al., 2015). While it is compelling to think that specific splicing changes could drive disease pathologies, the myriad of biologically interesting events suggests caution in attributing too much meaning to any individual event. We next recapitulated this stratification of patient groups using hierarchical clustering. Using the 489 differential events that were common to all groups (488 common to ALShigh, C9 and FTD, and one common to ALSlow as well) (Figure 6—figure supplement 3), patients with similar insolubility measurements were grouped close to one another. To further support the hypothesis that all DS events are due to insolubility and not particular clinical distinctions, clustering of patients based on the top events that were unique to each grouping (20 from each ALShigh, C9 and FTD, and all three events in ALSlow) also ordered the patients according to insolubility (Figure 6—figure supplement 4). Regardless of whether clustering was performed with either the most shared (Figure 6—figure supplement 3) or the most divergent (Figure 6—figure supplement 4) events, the two groups separated by the farthest distance contained almost exactly the same patients, whereas the controls (neurological normal and SOD1) clustered together with the patients with the lowest insolubility, including samples not in the original ALSlow group. 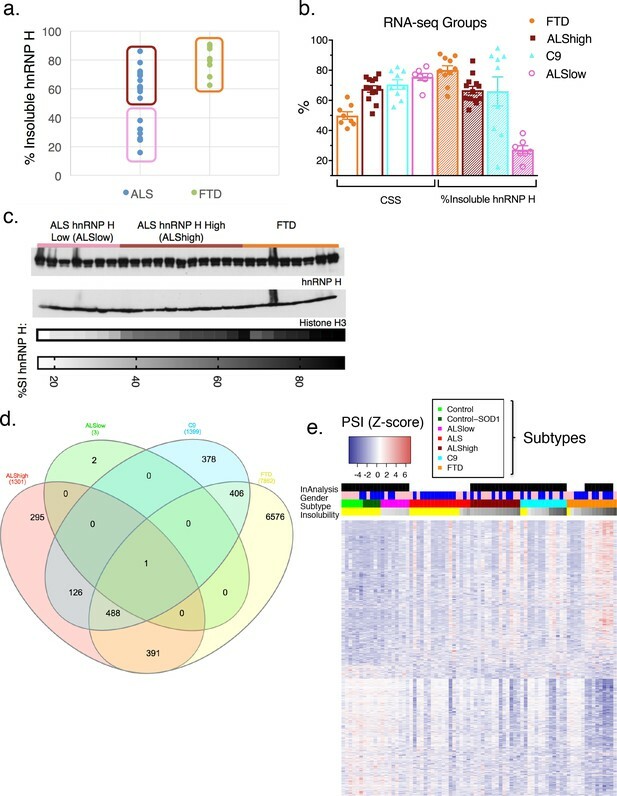 In summary, we conclude that widespread, global splicing differences occur in ALS and FTD, and these can be explained by biochemical insolubility of RBPs, with corresponding severity across distinct brain regions. In the above analysis based on solubility groupings, the FTD samples were noteworthy in that they displayed the highest hnRNP H insolubility, as well as the most numerous and acute PSI changes. However, several sporadic and C9 ALS patients with high insolubility had similar DS patterns, implying that the excessive events were not somehow specific to the FTD clinical diagnosis, but rather the result of exceptionally high insolubility of RBPs, which occurs at a greater rate in FTD than ALS. This suggests a possible relationship between patients identified as like-C9 and FTD. To determine if like C9-patients were indeed more likely to be diagnosed with FTD, we returned to our initial assignments of like-C9 and like-control. Of the 50 patients in this analysis, 18 had symptoms of FTD, and were clinically diagnosed with either ALS-FTD or pure FTD, while the remaining 32 patients were diagnosed with ALS without cognitive or behavioral impairment. The majority (13/18; 72%) of the patients characterized by symptoms of FTD were like-C9, while only five of the patients with FTD symptoms were like-control. We compared these ratios using a Fisher’s exact test, and found that like-C9 patients were on average 3.8 times more likely to have symptoms of FTD versus like-control patients (Figure 6e, p=0.032). Strikingly, these findings mirror what has been reported for C9 patients, who are approximately four times more likely than the ALS population at large to receive a diagnosis of FTD (Byrne et al., 2012). Thus we conclude that this distinction of like-C9 based upon splicing and accompanying biochemical insolubility confers clinical susceptibility to FTD, just as occurs in authentic C9ALS patients. 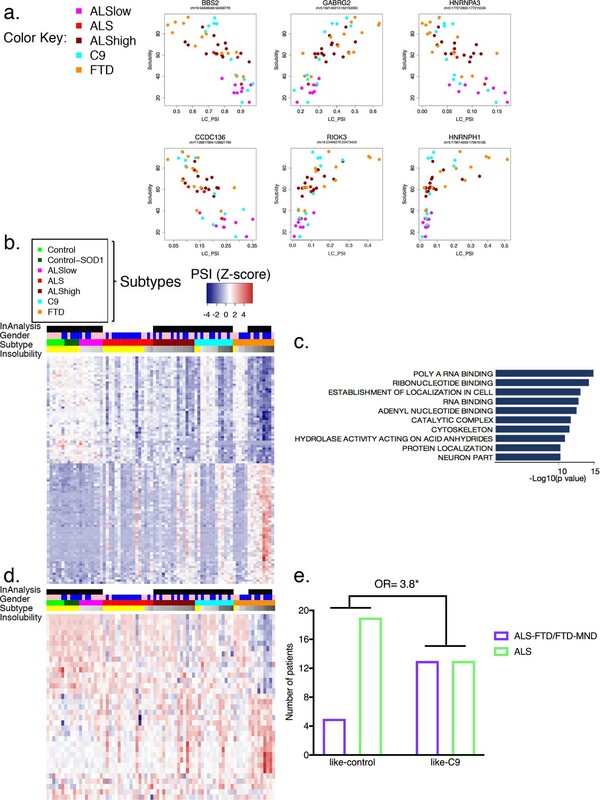 In this study, we have characterized a diverse cohort of ALS/FTD patient brains and identified a signature of graded splicing dysregulation that correlates in magnitude with insolubility of several abundant and disease-relevant RBPs. Our work provides evidence that aberrant alternative splicing is a common molecular feature of C9ALS/FTD and sporadic ALS/FTD patients, and importantly, that these changes reflect underlying biochemical changes that manifest in RBP aggregation. A unified vision of what causes ALS and FTD at the molecular levels has remained highly speculative despite great advances in our understanding of the genetics that contribute to this disease spectrum (Taylor et al., 2016). Thus, our work is significant in that it provides a compelling case for the existence of a shared biochemical mechanism that occurs in ALS, FTD and ALS/FTD, and which can be rationalized in the context of other known disease mutations and pathologies. RNA splicing defects have previously been reported in C9ALS (Conlon et al., 2016) and sporadic ALS/FTD (Ling et al., 2015; Prudencio et al., 2015). However, in the absence of mechanistic insights into the origins of these defects in sporadic patients, the assumed culprit has been TDP-43 deficiency, reflecting the almost universal observation of TDP-43 histopathology (Polymenidou et al., 2011; Lagier-Tourenne et al., 2012; Ling et al., 2015). Through stratification of patient samples based on biochemical insolubility of hnRNP H, and by extension TDP-43, we found that TDP-43 pathology is not sufficient to confer detectable splicing differences relative to neurologically normal controls or SOD1 ALS patients. Thus, our data suggest a model (Figure 6—figure supplement 5) in which TDP-43 is just one of several affected RBPs. Our finding that biochemical insolubility of TDP-43 correlates with splicing defects as well as with insolubility of several other RBPs casts doubt on the TDP-43-centric view of ALS (Lagier-Tourenne and Cleveland, 2009; Scotter et al., 2015). Given the decoupling of visible pathology from biochemical insolubility, with only the latter correlated with splicing dysregulation, our results strongly suggest that ALS/FTD should be considered a multiRBP proteinopathy rather than a TDP-43 proteinopathy. The fact that approximately half of sporadic ALS/FTD patient brains do not display significant splicing defects or insoluble protein seemingly contradicts our assertion that this is the common mechanism underlying disease. One possibility is that an entirely distinct mechanism drives neurodegeneration in these patients, perhaps one similar to SOD1ALS in which soluble hnRNP H and splicing profiles resemble neurologically normal controls. Alternatively, the range of abnormality in sALS patients we observed may reflect what we detected in C9ALS/FTD (Conlon et al., 2016). Specifically, some C9 patients displayed severe splicing changes, while others were indistinguishable from normal controls. One possible explanation for this is that in both C9s and sporadic cases, some patients display these changes only on a limited scale. For example, splicing and insolubility changes may be confined to only the most vulnerable cell types in patients (sporadic and C9) that were modestly different from control. As a result, changes in splicing or solubility that occur in a minority subpopulation of cells could be diluted in bulk studies by more numerous transcripts derived from unaffected cell types. A future goal will be to try to investigate whether such specific splicing events indeed exist that are unique or disproportionately relevant to affected neuronal populations. Another interpretation of our data is that detectable splicing changes and highly insoluble protein levels may only become evident in the later stages of a progressive coalescence of RBPs (Lin et al., 2015; Murakami et al., 2015; Patel et al., 2015). In such a model, splicing changes, while undoubtedly contributory, may not be the sole, or critical, event driving disease onset or progression, but rather a consequence of perturbations in the equilibrium of soluble versus aggregated RBPs (Figure 6—figure supplement 5). Many studies of ALS/FTD disease mechanisms have focused on a complex equilibrium between differentially concentrated RBPs in physically distinct phases. Importantly, many factors, including mutations known to cause disease (Kim et al., 2013; Murakami et al., 2015; Patel et al., 2015; Martinez et al., 2016; Fay et al., 2017; Mackenzie et al., 2017), are capable of influencing the balance between protein concentrations in each phase over time (Ramaswami et al., 2013). Our model (Figure 6—figure supplement 5) proposes that all ALS/FTD patients fall at varying points beyond a hypothetical ‘toxicity boundary’ that would be analogous to the phase boundaries that describe physiological granule formation (Weber and Brangwynne, 2012; Elbaum-Garfinkle et al., 2015), only unidirectional. The magnitude of this imbalance, or position past a theoretical tipping point, would thus be related to increased abundance of biochemically insoluble protein and decreased levels of functional RBPs, leading to aberrant splicing. The above model depicts RBP insolubility as lying upstream of splicing defects. However, it is worth considering the possibility that splicing changes lead to, or at least contribute to, insolubility. Notably, two events found to affect the RBPs hnRNP D and hnRNP A1 (exons 7 and 8, respectively) have been shown to cause inclusion of glycine-tyrosine (GY)-rich intrinsically disordered regions (IDRs) in their respective proteins (Gueroussov et al., 2017). In our analysis, we observed increased inclusion of hnRNP D exon 7, leading to an isoform with an extended GY-rich region that makes increased contacts with other hnRNPs, thereby potentially promoting overly stable RBP complexes. Inclusion of hnRNP A1 exon 8 also extends its IDR, although the difference in the number of GY-repeats is not as strong as for hnRNP D (Gueroussov et al., 2017). Somewhat surprisingly, hnRNP A1 exon 8 was found in our data to be more skipped as RBP insolubility increased, which seems to contradict a recent study suggesting that reduced levels of TDP-43 promote inclusion of this exon (Deshaies et al., 2018). In contrast, the loss of soluble FUS, which regulates its own transcript, may explain FUS splicing defects in our data. Normally, FUS protein represses inclusion of exon 7, leading to a FUS isoform that undergoes nonsense-mediated decay in a self-regulating loop (Zhou et al., 2013). Thus, it may be that reduced levels of soluble FUS lead to the observed increase in exon 7 inclusion, thereby resulting in excess levels of FUS that either seed RBP aggregates or ‘pile on’ to existing ones. Such a mechanism, whereby splicing changes affecting one or a few RBPs act as ‘drivers’ of RBP aggregation, can also be envisioned for other events in our analysis, for example, hnRNP H1, which we found undergoes differential splicing in its gly-rich IRD. Regardless of whether insolubility is upstream of splicing changes, or splicing changes precipitate insolubility, these events, and likely others, highlight how the two processes may reinforce one another in a vicious cycle, ultimately leading to the severe insolubility/splicing dysregulation we have documented in the like-C9 ALS and FTD cases. If all ALS-FTD indeed converges on the same mechanism then what factors dictate the onset and progression of disease at the clinical level? This is not straightforward, even when a known mutation underlies disease. In the case of C9, understanding how a single genetic polymorphism can lead to two different disorders, or a combination of the two, is perplexing. Further complicating matters, the C9 expansion has been associated with scarce disease incidence in a wide spectrum of neurodegenerative and psychiatric conditions, including Huntington’s Disease, Parkinson’s Disease, and Schizophrenia (Hensman Moss et al., 2014; Lesage et al., 2013; McLaughlin et al., 2017). It is unclear if these different patterns of neuronal degeneration reflect intra-patient variation in toxic burden across cell types/brain regions (Mackenzie et al., 2014), or if particular cell-types have inherently lower tolerance to toxic threats that are uniform across an individual (Nijssen et al., 2017). It may be that a combination of burden mosaicism and varying toxicity thresholds of distinct cell types converge to affect disease progression, such that mutation alone cannot predict the disease course of a given individual (Van Mossevelde et al., 2017). In our C9 model, these hypothetical burdens may be manifested and/or enhanced by transcriptional activity of the expanded locus (Liu et al., 2014), heightened ratio of aggregated to soluble hnRNP H, and increasingly severe splicing changes. For sALS/FTD, we know the latter two occur, but as of yet, what triggers this remains a mystery. The variation in disease severity implied in our model also suggests a natural progression of disease from ALS to FTD along this clinical spectrum. Our results suggest that FTD patients are further past this hypothetical boundary than are patients with pure ALS, as reflected by the highest values of RBP insolubility, and most global splicing changes. Given that all of the patients in our cohort with FTD also displayed MN loss, but not all ALS patients displayed signs of frontal cortex deterioration, we propose that the distinct neuronal populations affected by this disease spectrum have differential vulnerabilities to the alterations in granule dynamics that define the toxicity boundary. The heightened sensitivity of spinal MNs implied by this gradient parallels what is known about SMA, a disease where subtle alterations in the concentration of the protein SMN cause highly specific degeneration of spinal MNs, with further increasing deficiency in SMN resulting in wider systemic dysfunction (Tu et al., 2017). In both cases, disease mechanisms have been suggested to converge on perturbations of granule dynamics (Zhang et al., 2006; Shan et al., 2010; Ishihara et al., 2013) and RNA splicing (Tsuiji et al., 2013; Zhang et al., 2008). The observation that defects in mRNA splicing may have relevance to ALS was made 20 years ago, through examination of the disease-relevant EAAT2 gene product (Lin et al., 1998). In retrospect, our findings shed new light on the observation that splicing changes could be found region-specifically, and in most, but not all, sporadic patients. In addition to providing a potential mechanistic basis for this observation, our data can fit it into a broader mechanistic context that correlates changes in mRNA splicing with changes in RBP solubility. While the ubiquity of TDP-43 pathology to ALS/FTD, and the protein’s known roles in RNA processing, brought RNA biology to the forefront of research on these diseases, we now conclude that RNA processing defects are not simply correlated to visible pathology. Nonetheless, the microscopically invisible fluctuations in RBP concentration that we have described biochemically imply that this complex spectrum of disease states can be reached through many paths, some genetically mediated, some potentially driven by environment and experience. Our discovery that a large fraction of all ALS/FTD is characterized by a ‘like-C9’ signature and reflects a ‘multiRBP proteinopathy’ thus provides a unifying theme for these complex and lethal diseases. Human patient brains were donated for research by next of kin. Samples were acquired from the New York Brain Bank. C9 expansion testing was performed by repeat-primed PCR in the Clinical Pathology lab of Columbia University Medical Center. All available clinical and pathological records were collected and used to summarize patient demographics and disease features. Additional samples were obtained by the New York Genome Center as part of the Target ALS post-mortem core. Total RNA was extracted from patient cerebellum, polyA selected, reverse-transcribed, and amplified by 32P-PCR for 33 cycles with established primers as previously described (Conlon et al., 2016). Products were electrophoresed side-by-side on 6% native PAGE and exposed to phosphor. Percent inclusions were measured using ImageQuant, and replicate data from two independent RNA extractions per sample were graphed and analyzed with Graphpad for Prism. All primer sequences for hnRNP H (Conlon et al., 2016) and TDP-43 (Tollervey et al., 2011) targets were previously published. Primer sequences (5’−3’) for ACHE are as follows: 4F: GAACCGCTTCCTCCCCAAATT; 5aR: CAGCCTCCCCATGGGTGAA; 5bR: GTGGAACTCGGCCTTCCACT. Biochemical fractionation using Sarkosyl-containing buffers was performed as previously described (Conlon et al., 2016), with 21,000 x g centrifugation (15 minutes) substituted for 180,000 x g (30 minutes) where indicated. All three fractions, soluble, sarkosyl soluble and sarkosyl insoluble, were western blotted simultaneously, and the band intensities of each fraction were quantified using ImageJ from a single exposure. Western blotting was performed as previously described (Conlon et al., 2016). Antibodies used in include Actin (Sigma, A2066), hnRNP H (Bethyl, A300-511), TDP-43 (Proteintech, 10782–2-AP), FUS (Santa Cruz Biotechnologies, H-6), GAPDH (Sigma, G9545), hnRNP A1 (Sigma, 4B10), Histone H3 (Abcam, 1791), SMN (Sigma, S2944), U2AF65 (Sigma, U4758), C9ORF72 (Novus, 1086CGP), FLAG-M2 (Sigma, F1804). All primary antibodies were incubated in Pierce Protein-free blocking buffer. Fractionation was performed as described (Conlon et al., 2016) with the following exceptions: after the 180,000 x g centrifugation, the insoluble pellet was washed briefly with milliQ water, then incubated in 20 mM Tris, 100 mM KCl (supplemented with 10 mM phenylmethylsulfonyl fluoride (PMSF) and 10 μg/ml each of aprotinin, leupeptin and pepstatin [a/l/p]) equal to 5% the volume of the Sarksosyl soluble-fraction. The pellet was incubated with rotation for 24 hr at 4°C, then centrifuged briefly at 5000 x g. One microliter of elutant (without debris) was diluted into a final volume of 50 μl IP buffer (50 mM Tris pH 7.5, 150 mM NaCl, 0.5% NP-40, 10% glycerol with 10 mM PMSF and 10 μg/ml each of a/l/p) with either 0.5 ug TDP-43 antibody (Proteintech, 60019–2-Ig), 0.5 μg FLAG-M2 antibody (Sigma) or nothing, and incubated at 4°C for 60–100 min with rotation. One ul of input was removed and stored at 4°C. Protein A/G beads (Pierce; 10 μl per sample) were washed three times with 1 mL IP buffer, the resuspended in 25 μl IP buffer. Beads were then mixed with the 50 μl sample, and incubated for 16–24 hr at 4°C with rotation. Supernatants were separated from beads on a magnetic stand, and beads were washed three times with 1 mL high-salt IP buffer (50 mM Tris pH 7.5, 500 mM NaCl, 0.5% NP-40, 10% glycerol with 10 mM PMSF and 10 μg/ml each of a/l/p), with 5 min rotation at 4°C with each wash. Beads were centrifuged briefly (<10 s) at 500 x g after the third wash, and residual liquid was fully removed. Beads were eluted for 5–8 min with 100 mM glycine, pH 2.0 at room temperature, then immediately neutralized with 100 mM Tris pH 10.0. The eluent was mixed with 4X SDS sample buffer, boiled, electrophoresed by 8% SDS-PAGE, and western blotted with hnRNP H (ThermoFisher, PA5-27610) and TDP-43 (Proteintech, 10782–2-AP) antibodies. Total RNA was extracted from flash-frozen post-mortem cerebellum tissue in Trizol/Chloroform and purified using a Qiagen RNeasy minikit column. Starting form 500 ng total RNA input, rRNA depletion and library preparation were performed according to the manufacturer’s conditions using the KAPA Stranded RNA-Seq Kit with RiboErase and unique Illumina-compatible indexes (NEXTflex RNA-seq Barcodes, BioScientific). Multiplexed libraries 550 bp in length were sequenced PE 125 (Illumina HiSeq 2500). Forty to sixty million filtered reads were aligned to GRCh38 using STAR (2.5.2a) (Dobin and Gingeras, 2015). Differential splicing analysis was performed using the LeafCutter annotation-free algorithm (Li et al., 2018). The package was implemented with default parameter settings per the author’s recommendations: at least 50 split reads must support the cluster with introns up to 500 kb. Only clusters with p-adjusted <0.1 were considered for further analysis (a lower p-adjusted cutoff proved to be too stringent, with no significant clusters listing for the ALSlow analysis). We used gender as an additional co-variate to prevent events attributable to gender from cluttering the results. Variations in intron splicing were considered significant in ALS/FTD when the Percentage Spliced Index (PSI) compared to control differed by more than 10% (|∆PSI| ≥ 0.1) with 10% FDR cutoff. Differential splicing events were then mapped to gene names to identify events of interest using Gencode version 25. European Journal of Neurology 16:745–751. The Journal of Biological Chemistry 280:37572–37584. Journal of Proteome Research 9:1104–1120. Neuropathology and Applied Neurobiology 41:24–46. The Journal of Biological Chemistry 282:19410–19417. New England Journal of Medicine 344:1688–1700. Journal of Neurology, Neurosurgery & Psychiatry 82:476–486. Journal of Biological Chemistry 286:1204–1215. Current Opinion in Genetics & Development 44:117–124. Trends in Molecular Medicine 20:66–71. Thank you for submitting your article "Unexpected similarities between C9ORF72 and sporadic forms of ALS/FTD suggest a common disease mechanism" for consideration by eLife. Your article has been reviewed by three peer reviewers, and the evaluation has been overseen by Douglas Black as the Reviewing Editor, and Kevin Struhl as the Senior Editor The following individuals involved in review of your submission have agreed to reveal their identity: Mani Ramaswami (Reviewer #1); Aaron D Gitler (Reviewer #2). This study from Conlon et al, is submitted as an advance that extends their previous eLife paper. In the earlier study, the authors examined the GGGGCC hexanucleotide repeat expansion in the C9ORF72 gene that causes ALS, and found that the expanded GGGGCC RNA bound to the splicing regulator hnRNP H. They further showed that the C9 mutation was associated with increased portions of the cellular hnRNP H being found in insoluble aggregates, and that C9 patient brains exhibited changes in splicing consistent with loss of hnRNP H function. ALS is a heterogeneous disease with multiple known causal mutations and with sporadic forms of unknown origin being highly prevalent. ALS is also often found in conjunction with frontal temporal dementia (FTD) and is thought to share a common origin with this and possibly other neurodegenerative disorders. In the new studies, the authors examined autopsied brains from sporadic non-C9 cases of ALS and FTD. Testing a panel of hnRNP H target exons, they identified a subset of cases of sporadic ALS (sALS) and particularly FTD with motor neuron degeneration that exhibit the patterns of splicing of C9 cerebellum. In this subset of sALS patients multiple hnRNP H enhanced exons showed lower inclusion and a few hnRNP H repressed exons showed higher levels of splicing, compared to other sALS patient brains or to control brains. Defining the sALS patients as "like-C9" in their splicing, or "like-control", they examined hnRNP H solubility in the cortices of these two patient groups. They found that in the like-C9 cortex a substantial portion of the hnRNP H was in the sarkosyl-insoluble pellet, and this was not seen in the like-control patient brains. The fraction of hnRNP H found in the sarkosyl pellet correlated strongly with the averaged splicing changes of the H dependent exons. In novel experiments examining the sarkosyl pellet fraction, they found that other RNA binding proteins known to be mutated or otherwise implicated in motor neuron disease also showed greater aggregation in the like-C9 patients compared to the like-control. These included TDP-43, FUS and hnRNP A1, whereas other proteins such as GAPDH were not aggregating. These results were extended by testing more selective pelleting assays and additional proteins to yield similar conclusions that the insolubility of a range of RNA binding proteins seen in ALS brain correlated with the observed splicing changes. The finding of multiple RBP's aggregating in parallel with hnRNP H led to a broader RNAseq assessment of splicing in the cerebelli of a range of ALS/FTD patients. Examining all the exon changes without regard to hnRNP H regulation, the authors found distinct regulatory clusters of splicing events in ALS patients that correlate with RBP aggregation, regardless of disease classification. These data have several important implications for neurodegenerative disease. They define a subset of sporadic ALS patients with similar features to patients with the C9ORF72 mutation. The protein aggregation seen in C9 and like-C9 patients extends beyond hnRNP H to other RNA binding proteins mutated in other forms of ALS. 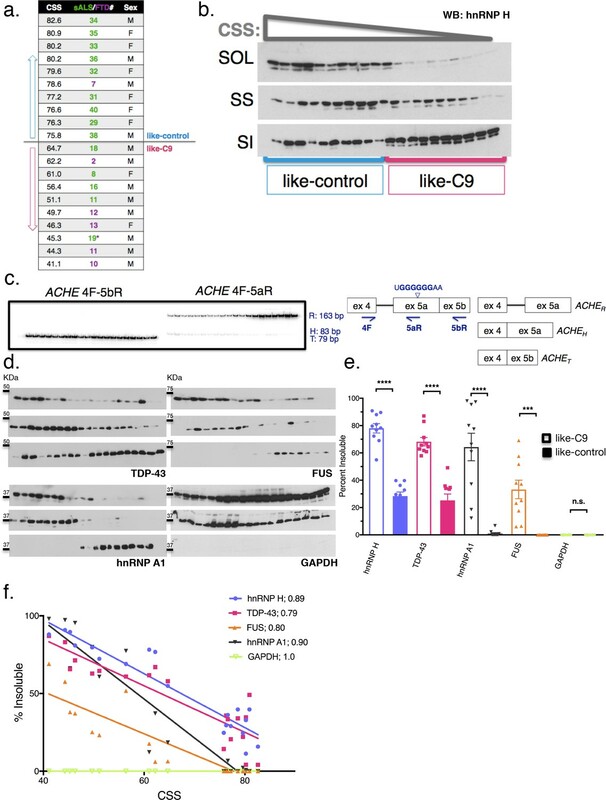 In an intriguing observation, SMN1, whose loss of function is the cause of another motor neuron disease Spinal Muscular Atrophy, is also seen to aggregate in the like-C9 brains. Also interesting is the differential splicing of many RBP transcripts that the authors speculate could play an additional role in altering the splicing phenotype of ALS brain. Formation of TDP-43 inclusions in the motor cortex and elsewhere has long been used as a histopathological marker of ALS. However, the sarkosyl-insoluble RBP aggregates studied here as markers of like-C9 ALS (and that include TDP-43), were not seen to correlate with the histological TDP-43 inclusions seen across all ALS. These inclusions are speculated to perhaps be late events related to cell death rather than a causal factor in the disease. Direct experimental support for similarities between sporadic and genetic forms of ALS/FTD is important and valuable, and the description of ALS/FTD as RNA-binding proteinopathy instead of only a TDP-43 proteinopathy is an important new concept for the field. The reviewers all found this study to be of broad interest for both neurodegenerative disease and RNA biology, and to be suitable for publication as an eLife Research Advance. Major concerns were largely related to how the data are presented and discussed. 1) Throughout the paper and the previous study, the RNAseq analyses of splicing were carried out on cerebellar RNA, while the biochemical analyses of RNA binding protein aggregation used samples from the motor cortex, where the degeneration occurs. The authors cite valid practical reasons for doing the sequencing on cerebellar samples. However, they do not discuss possible implications of carrying out the two analyses on two very different brain regions. They should discuss whether the cerebellum also exhibits degeneration or is also forming the RBP aggregates. If not, they should discuss whether the splicing changes are truly a direct result of the protein aggregation. If the aggregates are formed across all brain regions, is there any cell type specificity to their presence? Are they found in other cells and tissues – similar to the loss of Smn1 in SMA? If they are found across all tissues, it is not clear what model the authors propose for the role of the protein aggregates. Different neurons and neuronal structures exhibit many differences in their gene expression and splicing and there will likely be cerebellar-specific and cortex-specific splicing events that are dependent on the aggregating proteins. If the disease targets motor neurons, shouldn't there be an assessment of the splicing changes in the tissue containing these cells? 2) The authors should also expand on the relationship of their new findings to the original splicing signature reported in 2016. Are the hnRNP H dependent splicing changes and the hnRNP H insolubility in C9 due to the expanded repeat RNAs sequestering hnRNP H? Or is it possible that the C9 aggregation is also caused other alterations in other RBPs that lead to the hnRNP H pathologies? A discussion of this will help readers assess the 2016 C9 data in light of their new findings. 3) Immunoblots for particular RNA binding proteins and other factors indicate that the formation of the aggregates is selective, but it is not clear how selective. Have the authors done shotgun mass spec identification of the proteins in the sarkosyl pellets? How many different proteins are aggregating? Are there other types of proteins in the aggregates besides RNA binders? If the MS data are available, it would potentially clarify several important questions regarding the aggregates and should be presented and discussed. 1) Throughout the paper and the previous study, the RNAseq analyses of splicing were carried out on cerebellar RNA, while the biochemical analyses of RNA binding protein aggregation used samples from the motor cortex, where the degeneration occurs. The authors cite valid practical reasons for doing the sequencing on cerebellar samples. However, they do not discuss possible implications of carrying out the two analyses on two very different brain regions. They should discuss whether the cerebellum also exhibits degeneration or is also forming the RBP aggregates. If not, they should discuss whether the splicing changes are truly a direct result of the protein aggregation. We agree with the reviewers that is an important issue. We have added the following sentences to the text at the end of the subsection “Like-C9 sALS/FTD display increased hnRNP H insolubility,” and provided new information (referencing “Purkinje Cell loss” status in Supplementary file 1) indicating that the cerebellum also exhibits degeneration. If the aggregates are formed across all brain regions, is there any cell type specificity to their presence? This is an interesting question, but in terms of a biochemical analysis (not immunofluorescence) would be virtually impossible to test given currently available methods. Are they found in other cells and tissues – similar to the loss of Smn1 in SMA? If they are found across all tissues, it is not clear what model the authors propose for the role of the protein aggregates. Different neurons and neuronal structures exhibit many differences in their gene expression and splicing and there will likely be cerebellar-specific and cortex-specific splicing events that are dependent on the aggregating proteins. This point reflects another facet of the brain’s complexity that we cannot account for properly. We agree that there may be important disease-relevant contributions of splicing events that are specific to particular neuronal subtypes. However, identifying those changes would require a sophisticated analysis of multiple brain regions, or ideally, cell types, from the same patients, which would be further complicated by the comparison of degenerated cell populations in patients to non-degenerated ones in controls. Although we think such an analysis represents an important future direction, it is not something that could be addressed in the current study. However, to acknowledge this important point, we have added the following sentences to the Discussion section. If the disease targets motor neurons, shouldn't there be an assessment of the splicing changes in the tissue containing these cells? We agree that such an analysis would be worthwhile. However, technical difficulties, such as lower yield of RNA and spatial heterogeneity in the distribution of cell types over large volumes of tissue, make this challenging. In any case, the strong concordance between the extent of RBP aggregation in motor cortex and the magnitude of missplicing in cerebellum make a very strong case that the splicing defects we observed occur throughout the brain. This is now stressed in the text. An interesting question though is whether there may be a subset of transcripts that are misspliced in specific cell types such as motor neurons. However, an analysis of the depth required to detect this would be well beyond the scope of this study, technical difficulties aside. It is our view that there are multiple ‘seeds’ that can ultimately lead to similar aggregation, and that C9 RNA is probably a particularly strong ‘seed’. Examples of other potential ‘seeds’ are given in Figure 6—figure supplement 5. These include TARDBP mutation, hnRNPA1 mutation, FUS mutation, stress or injury. We mention in the Discussion section that “many factors, including mutations known to cause disease […] are capable of influencing the balance between protein concentrations in each phase over time.” Ultimately, we do not know what initiates the aggregation described in sporadic patients in this study, or whether there is one common ‘seed’ amongst these patients. All we can say is that these changes are readily detectable in a large fraction of patients. Furthermore, we have discussed how aberrant splicing could itself be a ‘seed’ through the altered expression of RBP isoforms with differential tendencies to make protein-protein interactions that may be prone to aggregation (Discussion section). In the case of C9s, we previously provided evidence that the aggregates contain G-Q forming RNA, suggesting the expansion in C9ORF72 can seed aggregates of hnRNP H via direct protein-RNA interactions (Conlon et al., 2016). Our new results now suggest this can further seed aggregation of additional RBPs such as TDP-43. Thus, if the two proteins are capable of co-aggregating, we envision that insolubility of a factor such as TDP-43 could be ‘upstream’ of hnRNP H insolubility. However, this begs the question, what makes TDP-43 insoluble? We found no experimental evidence for direct sequestration of TDP-43 by the expanded RNA. Furthermore, we have shown in this study that existence of TDP-43 pathology in degenerating regions such as the motor cortex does not necessarily translate into biochemically insoluble TDP-43, thus refuting the potential argument that TDP-43 pathology could be the cause of the hnRNP H insolubility and splicing changes. We agree that such an analysis would be informative; however, we did not generate any mass spec data. Such an analysis would likely not be straightforward and quantitatively accurate, as eluting insoluble proteins from the sarkosyl-insoluble pellet would likely lead to biases towards detecting proteins that re-solubilized more readily. Nonetheless, the method of eluting the pellet in a Tris solution that we used to perform co-IP could perhaps be optimized to perform mass spec, and we believe this represents an interesting future direction. This work was supported by NIH grant R35 GM 118136 to JLM. EGC was supported in part by NIH training grant 5T32GM008798. RNA sequencing and related analyses at the NYGC were supported by the ALS Association (grant 15-LGCA-234) and the Tow Foundation, which also provided direct support for the Eleanor and Lou Gehrig ALS Center (NAS). We acknowledge the Target ALS postmortem tissue core, as well as the New York Brain Bank for providing us with human brain samples. We thank Dr. Lawrence Honig of the Taub Institute/ADRC for providing FTD samples. We also thank Aarti Sharma and Beatriz Blanco-Redondo for many helpful discussions that helped shape this study. Human subjects: Human post-mortem brain samples were donated for research purposes by next of kin. © 2018, Conlon et al.